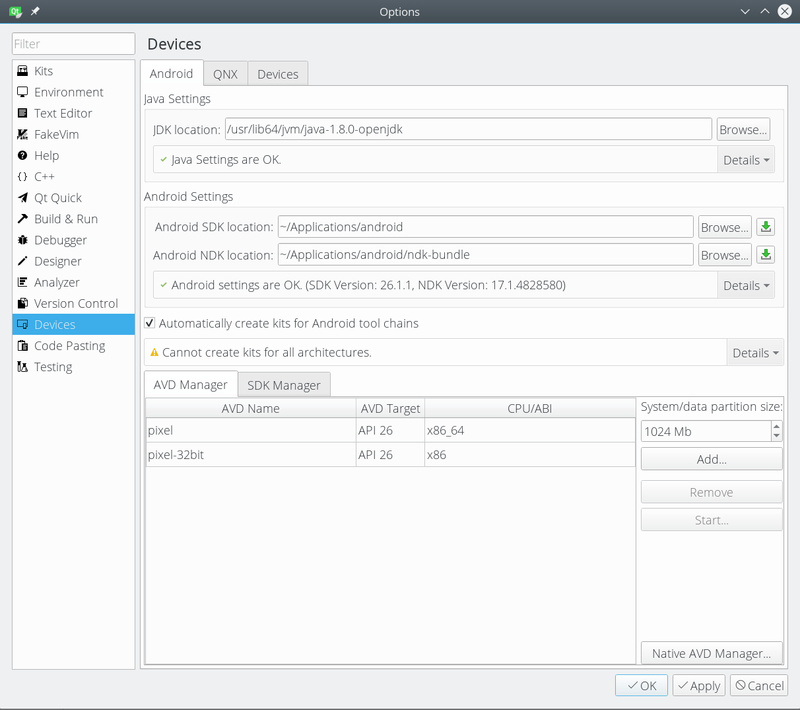 In this post I go through the detailed steps to get you set up with QtCreator Android app development. If you’re like me and like Qt/QtQuick/QML, or you’d simply like to explore this option, you might find the detailed set of steps, collected in one place helpful. 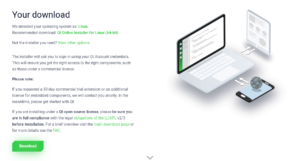 The steps described here worked on 64-bit Linux computer. If you’re on Mac or Windows, similar steps might work, but I haven’t tested them. 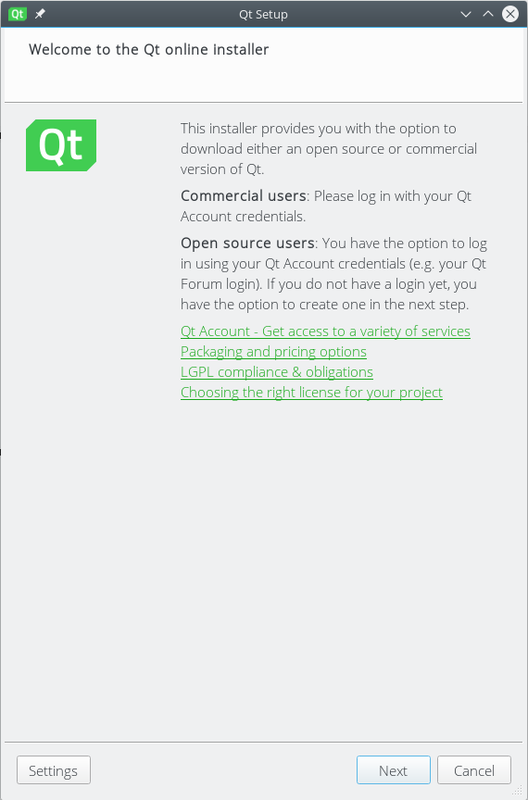 Note that Qt for Android documentation is here but we’ll go slowly, one step at a time, and also avoid common pitfalls along the way. 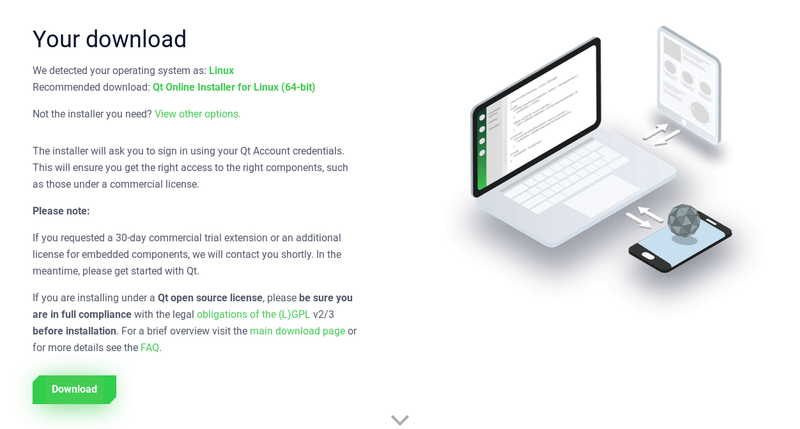 Install Java and KVM if you don’t have them yet. Either OpenJDK or Oracle Java should work. I use OpenJDK 1.8 which works great. Also follow KVM installation instructions for your environment. Unzip both Android SDK and NDK. Quick notes: (1) I’ll assume all your downloads are in ~/Downloads; (2) I personally like to keep ad-hoc (non-package manager installed) applications under ~/Applications and I’ll provide commands for that in the rest of the guide. Feel free to substitute that location to something else, but be mindful to change paths accordingly. If everything works so far – congrats! You have set up your Android environment. 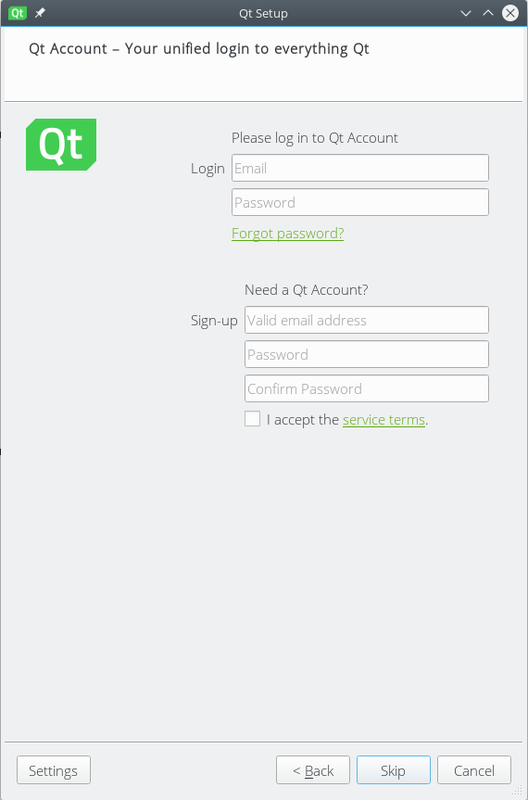 Now, let’s take care of your Qt development environment. 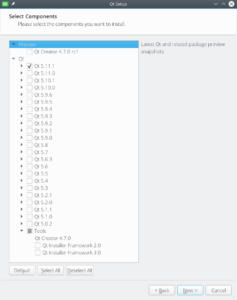 This will launch the installer which will guide you through the steps to install Qt and QtCreator in the location of your choice. 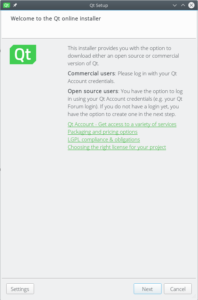 Note that you can safely skip through the login step.When you get to the “Select Components” step, make sure to select the most recent stable Qt version, in this case 5.11.1. 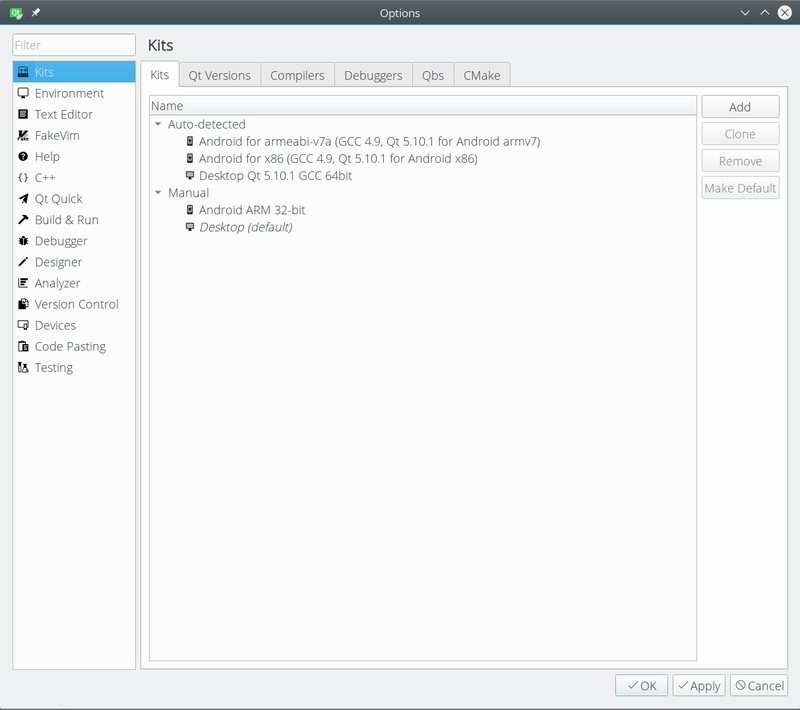 You’ll also notice that under “Tools” section, the QtCreator is pre-selected and cannot be unchecked. Proceed with the installation and wait for it to finish. This might take a while (10-15 mins), depending on your internet connection. 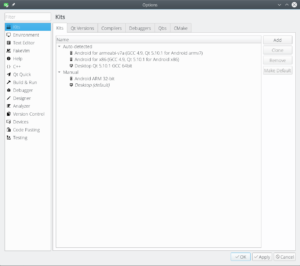 Once completed, you should have a working installation of QtCreator. 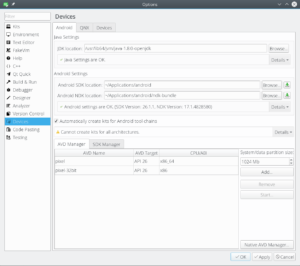 So let’s open QtCreator now and hook it up with our Android environment. 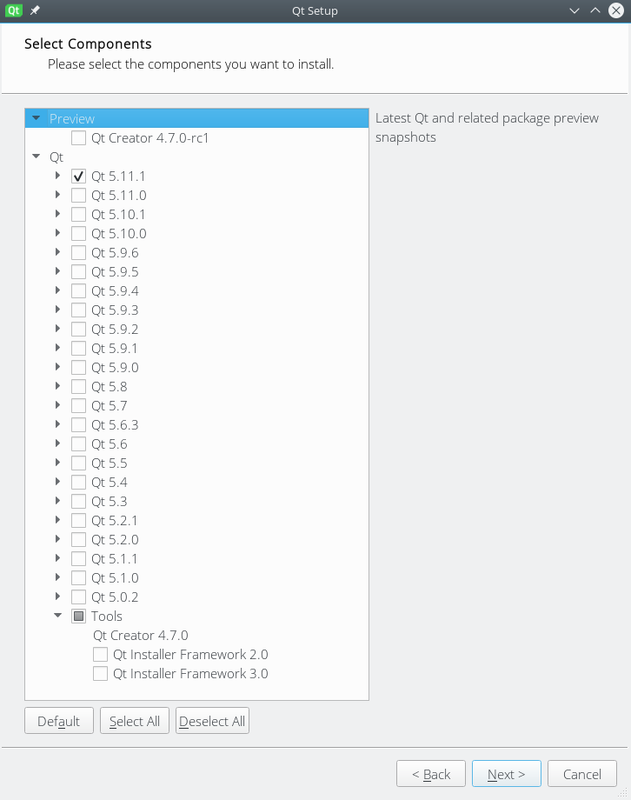 At this point, you should be ready to start making Qt apps for Android. Next step is to create a simple app! 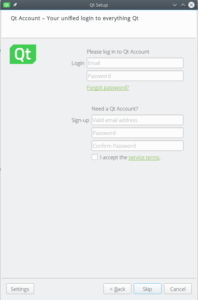 Check out numerous examples on Qt website, or the ones included with your QtCreator. And why not clone BARTist and contribute?